Naan is a delicious, puffy Indian bread, made with milk and yoghurt, it is perfect for mopping up spicy curries or having on their own. I love making these, its best to make them just before serving as they are great hot off the grill. Traditionally this bread is cooked on the walls of a tandoor (clay oven) it is not easy to recreate the intense heat in your cooker so the texture is slightly different, but they taste divine! Sift flour and add all the dry ingredients, mix to combine. Make a well in the centre and add the milk, yoghurt and melted butter with approx. ¾ cup of warm water. Knead the dough until smooth. Divide into 6-8 balls. 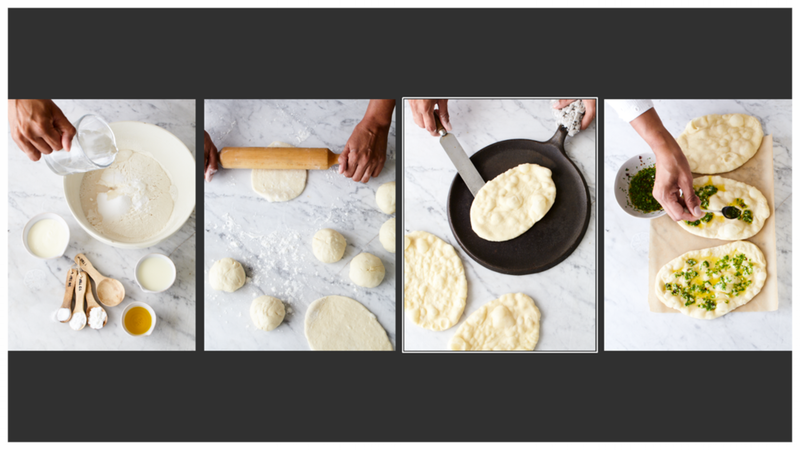 Roll out in to oblong naan shapes. On a non stick frying pan, cook the naan on one side and then place on a baking tray, do this with the remaining naan, brush the raw side with melted butter ( with the topping of your choice) grill until browned and blistered. Serve hot.